NOTE: All links, including picture blow-ups, open in this same browser window. To return to this web page use your browser's -BACK- button. 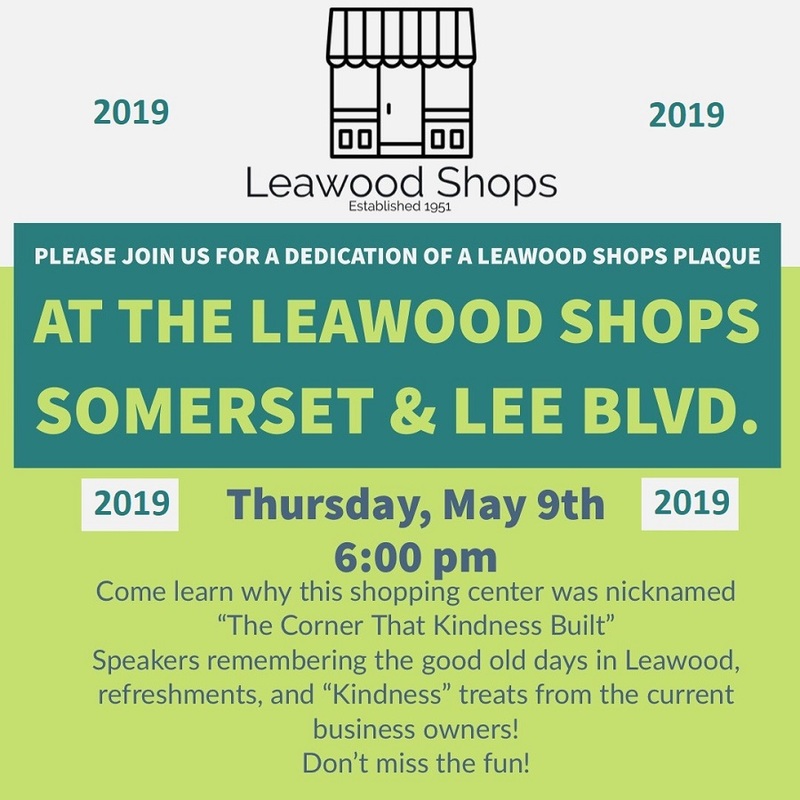 PLEASE JOIN US IN THE HISTORICAL DEDICATION OF LEAWOOD SHOPS - "THE CORNER THAT KINDNESS BUILT"
A long time ago, Tom Leathers dubbed this "The Corner That Kindness Built" in an article he wrote for the Squire Express. The conclusion of the article stated, "It would be appropriate if one of these days Leawood would honor the site." Twenty years later both the site and its founders have been honored. 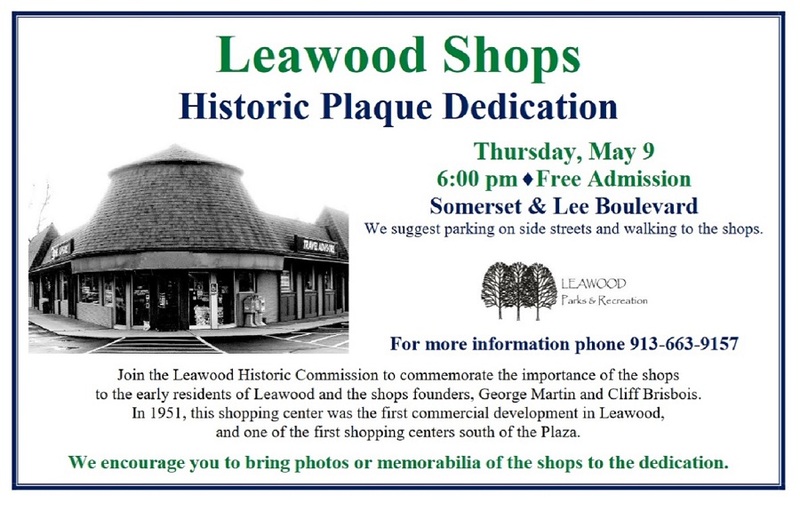 The new Leawood Shops owners and the Leawood Historical Commission have, together, fulfilled Tom's vision. IT'S BEEN A LONG TIME COMING! Please join us at the celebration May 9th! The below as compiled and written over many years (beginning November 2003) by Dan Martin (George's son). 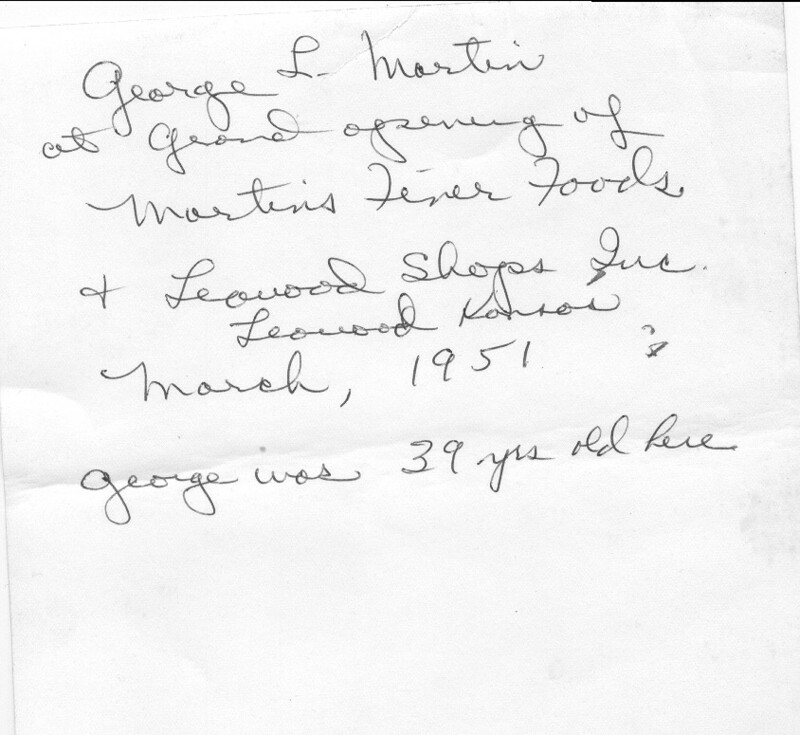 The "End of the Martin Era" article was primarily made up of excerpts of a letter that my father, George Martin, wrote to his longtime friend Tom Leathers, editor of the local Leawood Kansas newspaper. 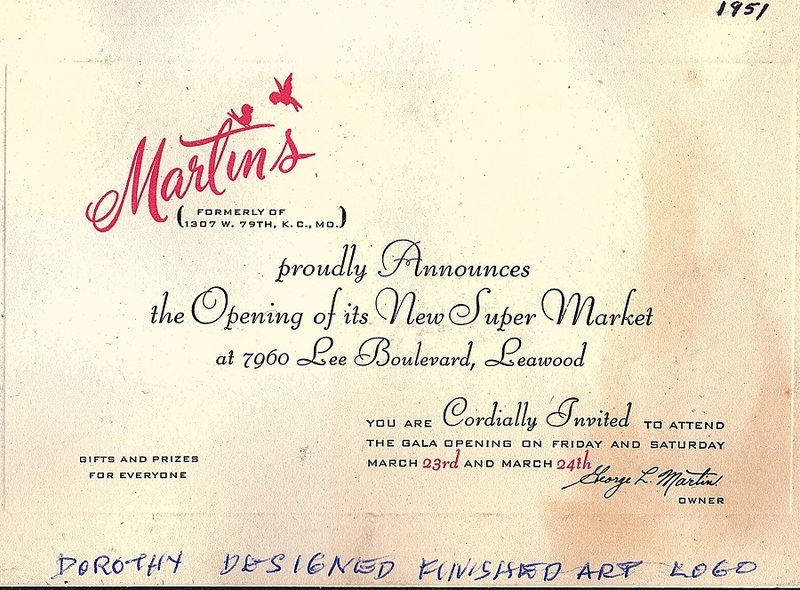 Apparently the letter contained my dad's reflections the day after the closing of the sale of the family food store, Martin's Finer Foods, on November 19th, 1980. 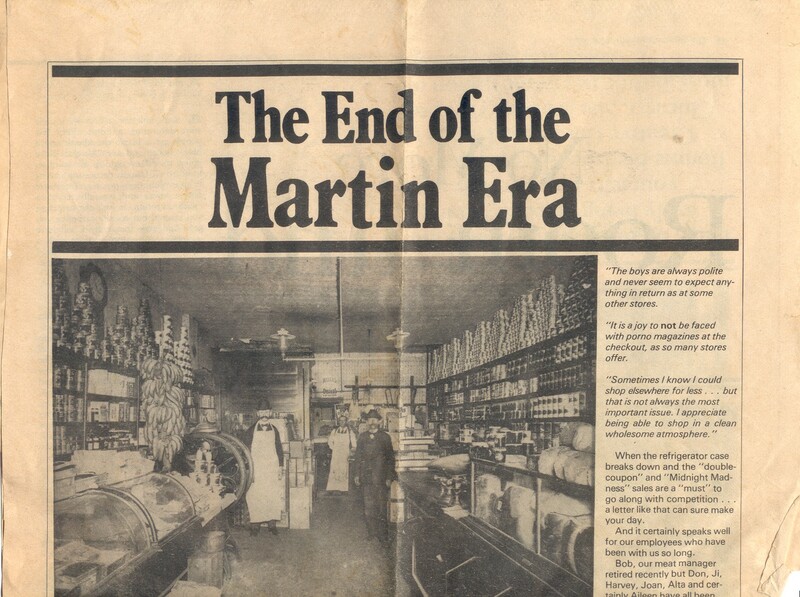 That day was truly the End of the Martin Era - the last of a series of grocery stores that began in 1898. 82 years is pretty long run, I'd say. Well done, Martin men. 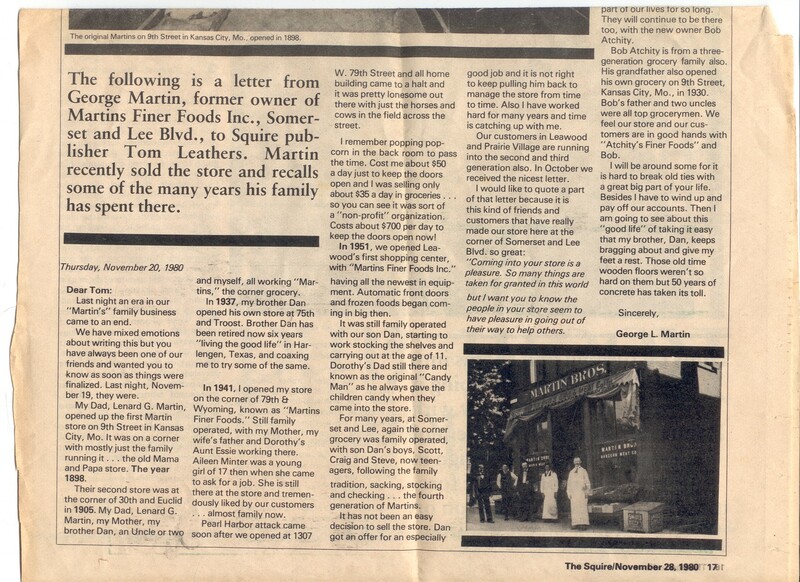 Many of my fathers long time associates are mentioned by Tom, along with myself and three of my sons who all worked at "Martin's" Dads letter is a succinct history of almost a century of Martin family involvement in the grocery business. Most successful of all was my Dad. Although it was a profitible business, his greatest triumph was in the loyalty showed him by his customers and employees. Dad always loved Nat "King" Cole's song Nature Boy (1.5 Mb .mp3). The lyrics in its refrain include the prophetic words "The greatest thing you'll ever learn, is just to love, and be loved in return." Someone once said that the only thing we can take from this earth is the love we've earned. I know that my father, therefore, has to be one of the richest of men in all of Paradise. 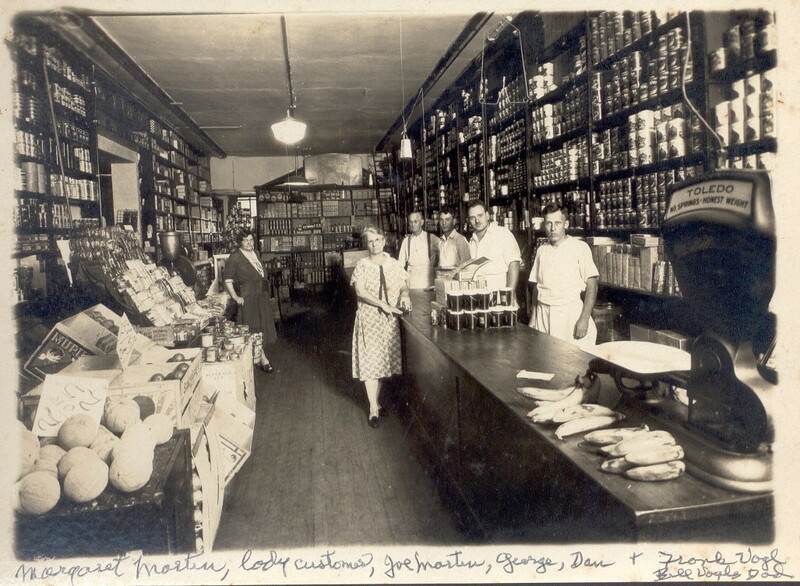 At left is the 1934 Martin's at 30th and Euclid in Kansas City, Missouri. 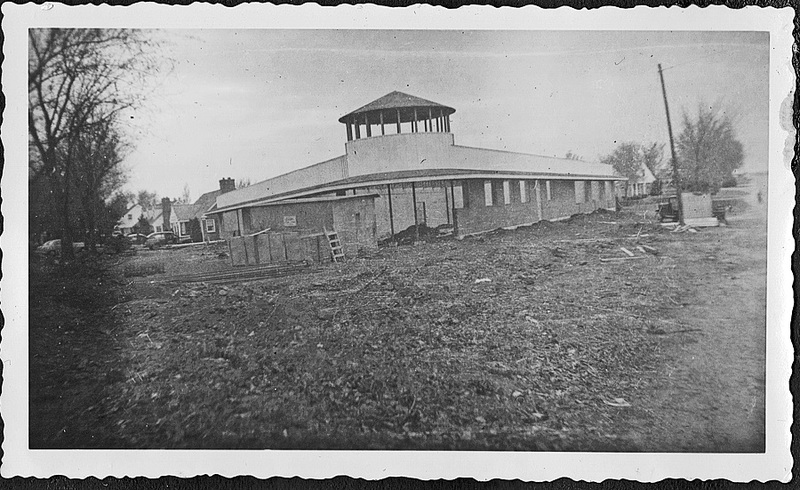 It has several modern upgrades compared to the 30+ year older photo of the market on 9th street in K.C. MO. (depicted in the article above) Notice for example the electric light (instead of gas) and the more compact coffee grinder in the Euclid store at left. 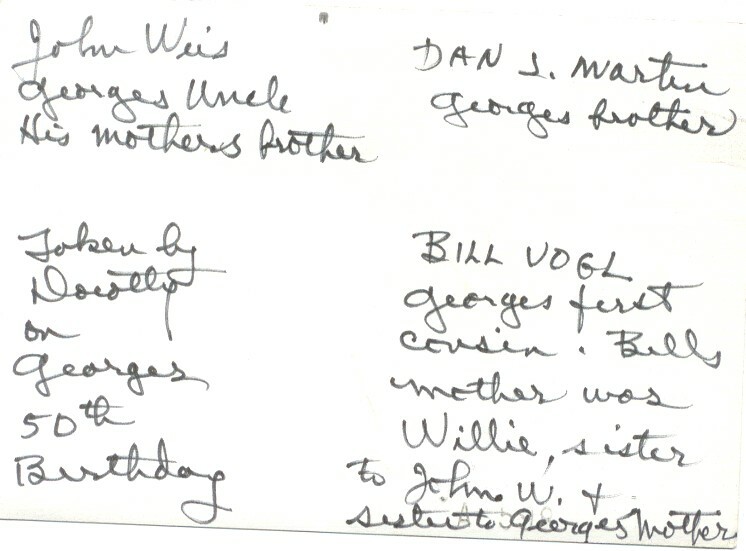 In it you see my grandmother Margaret Martin, uncle Joe Martin, my father George Martin, his brother Dan Martin, and an uncle on their mother's side Frank Vogl. Frank was brother to Bill Vogl who was married to Elvira. Their two children are Steve and Valerie who are about 5 years younger than me (son Dan) and my sister Roberta. 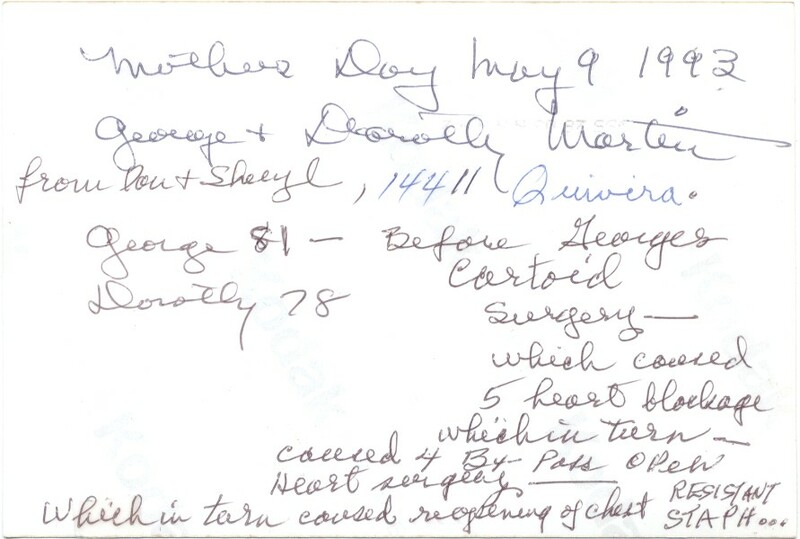 The scan at right is what Mom wrote on the back of the photo above. 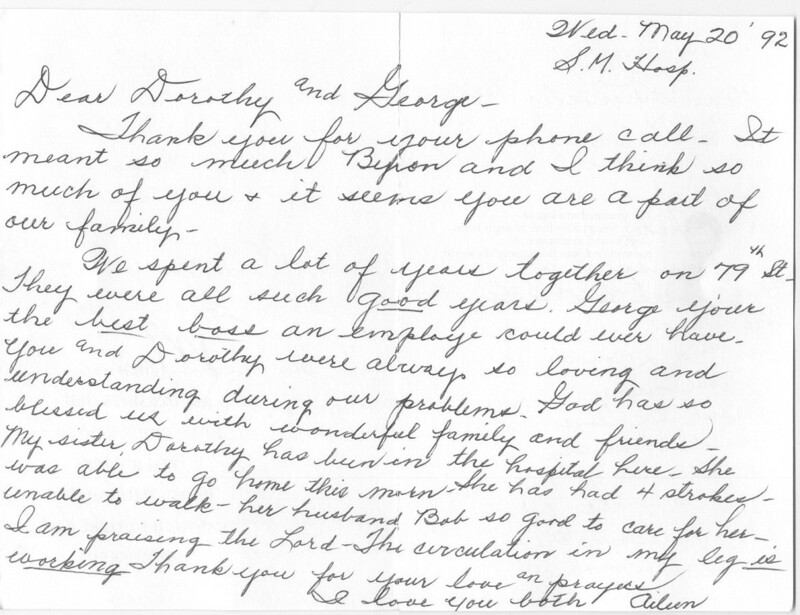 The larger relative size of her writing indicates that her comments were most likely made in the late 1980s. If you look closely, you can see that she wrote over (in the heavy marker that she began using to compensate for her failing eyesight) some of the names written apparently much earlier in my fathers own hand. 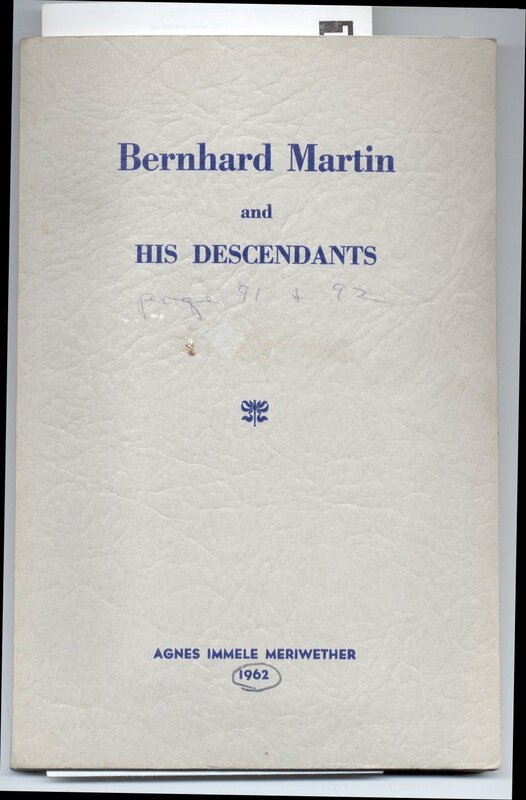 Although there is no date in his obituary, we can deduce that Bernard Martin (one of Dad's uncles) died sometime in 1934 (i.e. (1875 + 59). 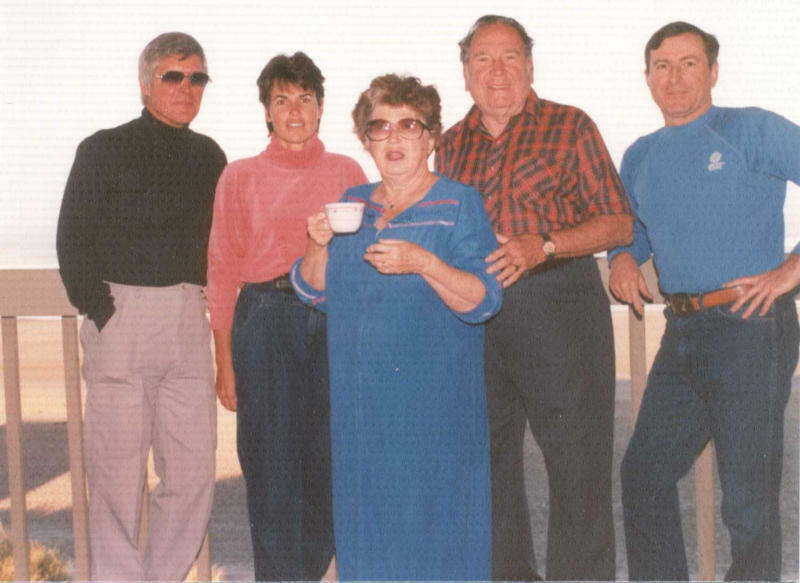 In it we learn that Bernard, Bert, Joeseph, Leonard (Dad's father), Barbara Brisbois (wife of Cliff Brisbois? ), Ellen, and Anna Imele were all brothers and sisters. 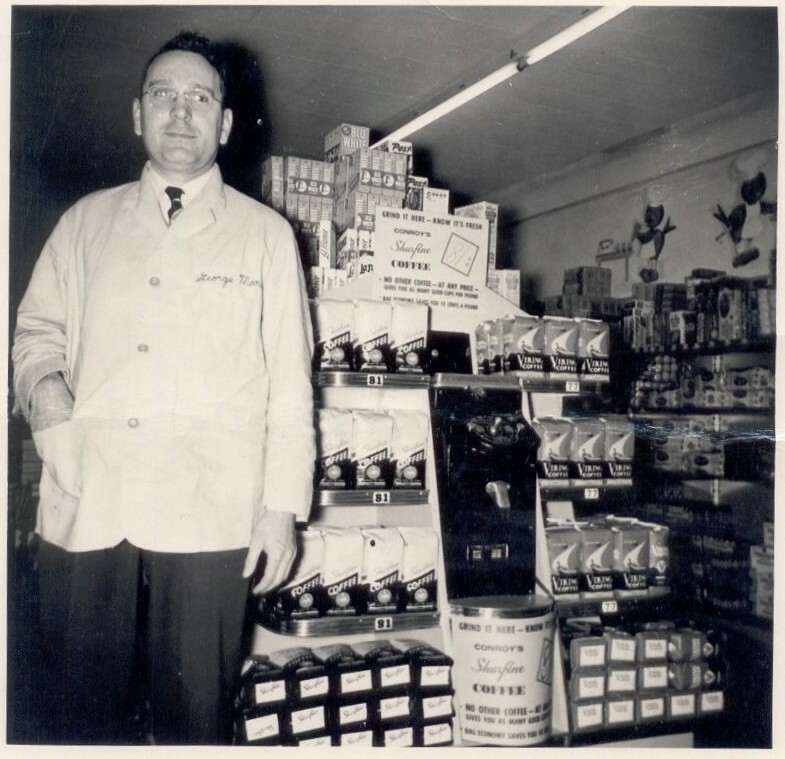 Cliff Brisbois and Dad Built the Leawood Shops shopping center in 1951. At the time of Bernards death Dad would have been 22 years old (born 1912). 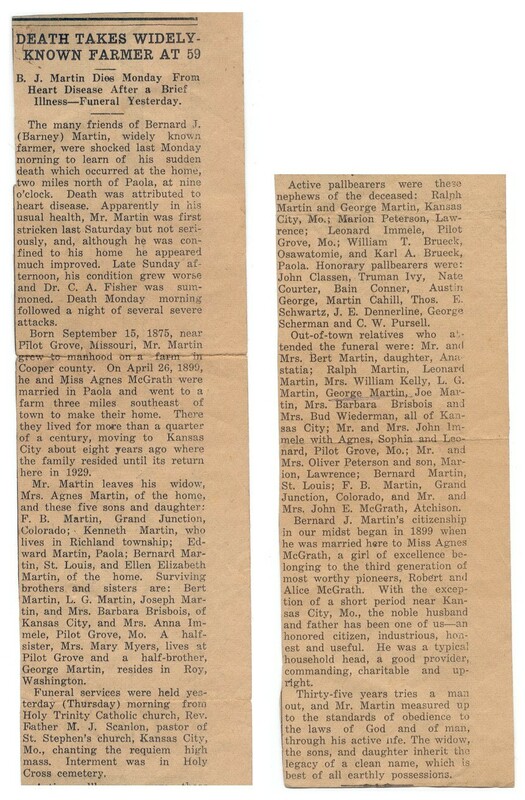 It must have been Dad who was the George Martin of Kansas City, MO who was listed as an "active" pallbearer (what then do inactive ones do?) for Barney, and not the George Martin from Roy, Washington. So we have relatives scattered far and wide: Grand Junction CO, St Louis MO, Lawrence KS to name a few other places. 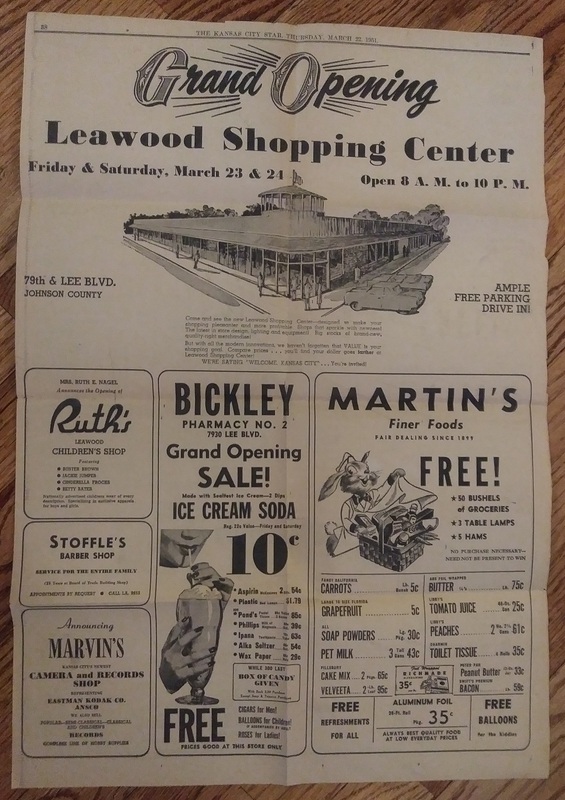 LEAWOOD SHOPS, GRAND OPENING: March 23rd & 24th, 1951 Leawood, Kansas My sister, Roberta Norman, said (December 14th 2018) this of the picture at left: "I just recently found this ad folded up in a genealogy book that includes Dad's lineage. I do not recall having ever seen this ad before. I evidently have had the book with the ad inside since before 2000, as the note attached to it was written by Dad. I might not have unfolded the aged newspaper, except for Dad's simple note that said this was the ad for the Grand Opening. Could Dad, talking from beyond, have wanted us to see it now?" - in the midwest - in the mid 20th Century: Libby's #2 1/2 size canned peaches 31 cents. 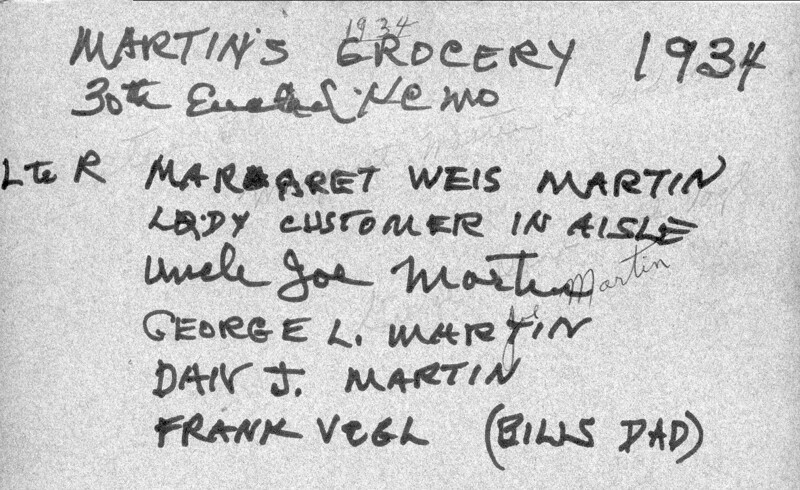 This photo (and Mom's comments written on the back) shows Dad in March of 1951 during the grand opening of Martin's Finer Foods at 7960 Lee Boulevard in Leawood KS. He was 39 years old at the time - looking a bit frumpy I have to say... Note the price of Shurfine and Viking whole bean coffee, 81 and 77 cents, respectively, for a full 16 oz bag. For the dollar of the that day, such an amount was probably the equivalent of $10 a pound now - And these were the price leader brands. I think Folgers and similar were on the order of $1.01 a pound (remember when coffee cans held a full pound, not the measly 10 or 12 ounces like they do today). Back then there were no "Mr. Coffee" machines. There were percolators, vacuum pots, drip pots and who knows what other kinds of coffee-making appliances. The coffee mill had a lever that selected the desired grind to match the specific needs of each type of maker. This was no blender-type device that pulverized the beans into dust (like you find today), but a precision milling machine that turned out a uniform grain-size - no dust - in the selected "caliber." In the background we can see several boxes of Kellogg's Raisin Bran edge-on and some various laundry products that have long since vanished. Stacked on the shelves along the back wall are loaves of Wonder Bread - or maybe it's Taystee. No plastic bags, bread was wrapped in brightly colored and printed waxed paper then. 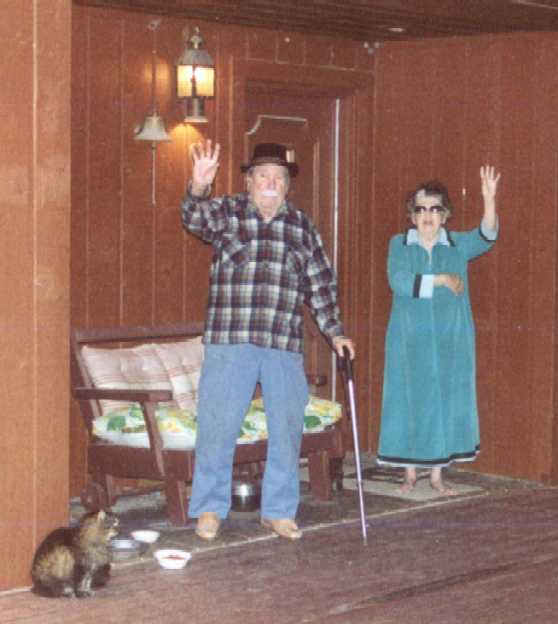 Notice Grandma Dorothy's "Martin Bird" murals on the back wall. The bakery theme shows that it was the cookie and bread aisle. Mom had a little gift shop in that store which she ran for many years. The store was remodled in 1968 and the adjoining hobby shop was absorbed to give a few hundred more square feet of precious sales area. Long before that time, Mom's gift shop had been absorbed by a previous expansion. 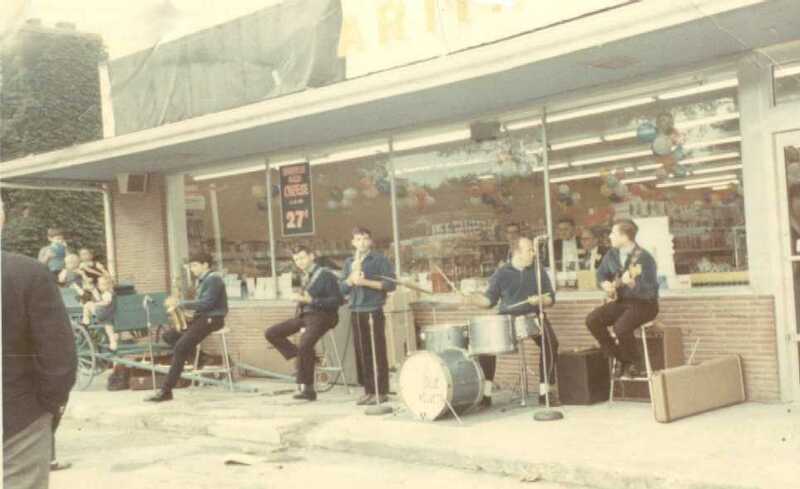 In the photo at right you see my band, The Blue Velvets, playing for the Grand Reopening in 1968. An electrical fire in the sign above us (still covered under a tarp) only two days before could have burnt down the whole shopping center, but by Divine Providence it did not. Unfortunately there is no publication date on this scan of an article by Tom Leathers in his Leawood Squire. But it had to have been sometime the same spring, in the year 2000, that my father George Martin passed away. 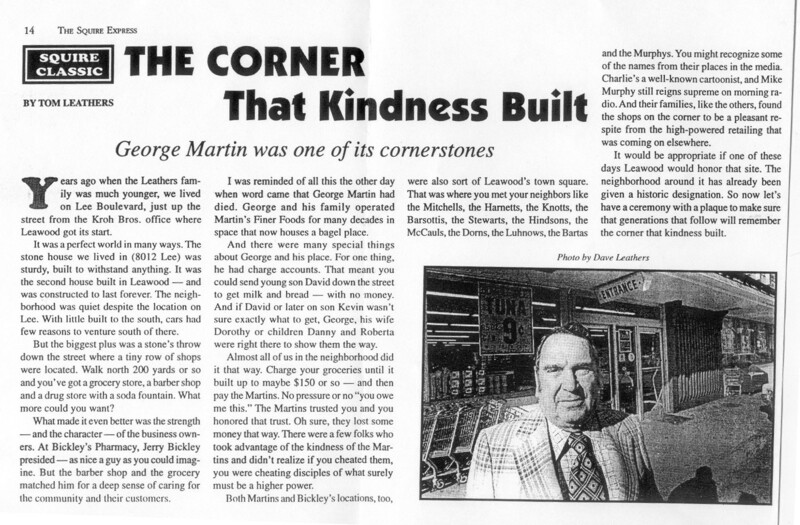 We sold Martin's Finer Foods - The Corner That Kindness Built - in 1980. Dad had been there every day since 1951, except for a very few (and often delayed) vacations (thanks to Mom for forcing him to take them) since the day he opened. 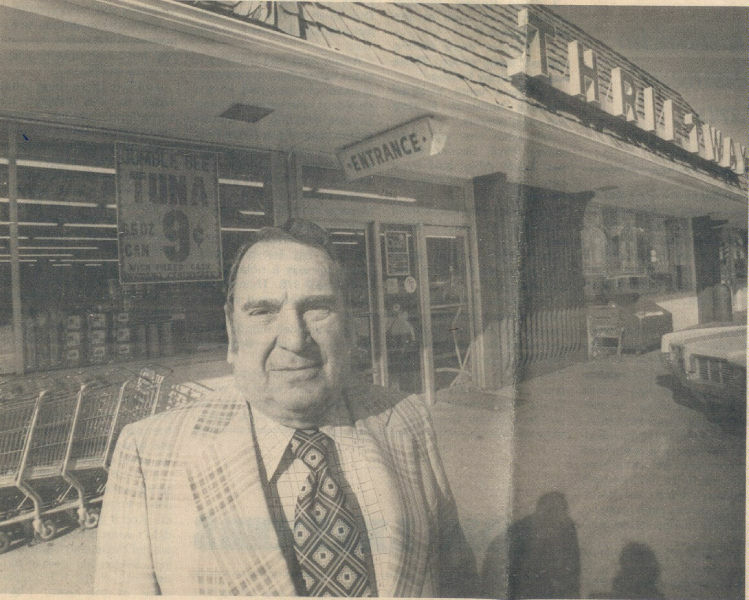 He had opened his first store in 1941 near 79th and Ward Parkway where McGonicle's Food Store still holds forth to this day. 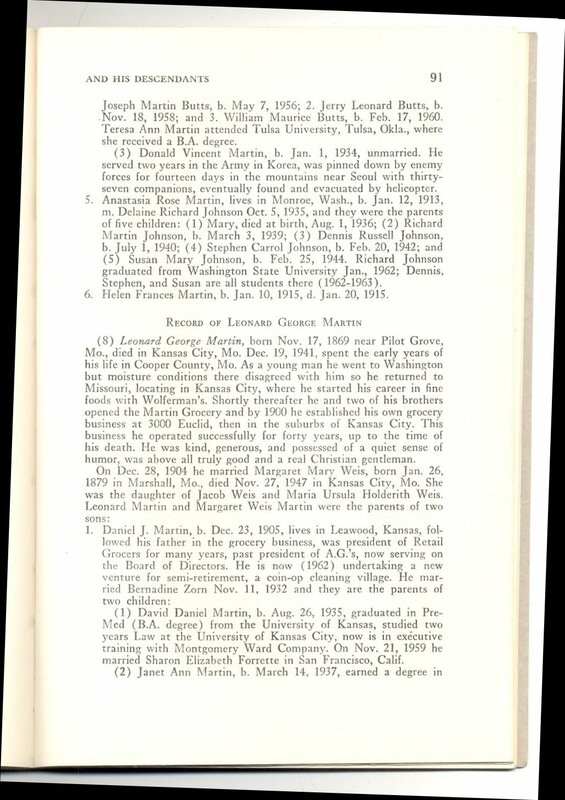 The Martin family has a varied history in the various wars of the 20th century. 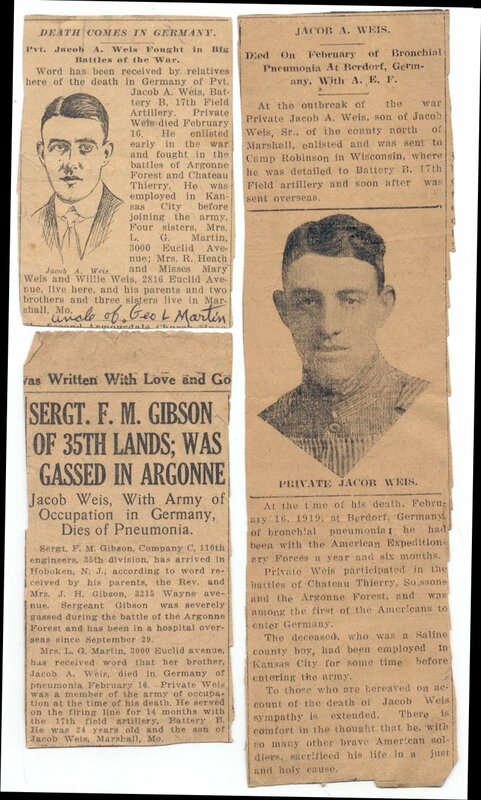 At left is an obit of Dad's uncle Jacob Weis who fought in World War I. My Mom's brother, Robert James Crutcher, died in a bombing run over Hamburg Germany in the last months of World War II. For all of WWII, Dad worked nights at the Pratt-Whitney plant building aircraft engines. It just might have been that one of Dad's engines was among the four powering that B-17 bomber (named "Smilin' Thru") in which "Uncle Bob" was killed (he was struck by flak that pierced the cockpit). The plane was shot up almost beyond recognition, but it still flew the rest of the crew home safely to England. After working all night at P-W, Dad would then drive to the City Market by 5 AM six days a week to buy fresh produce for his grocery store. Then he ran the store all day six days a week until 6 PM. One has to wonder when he found time for sleep - or anything. 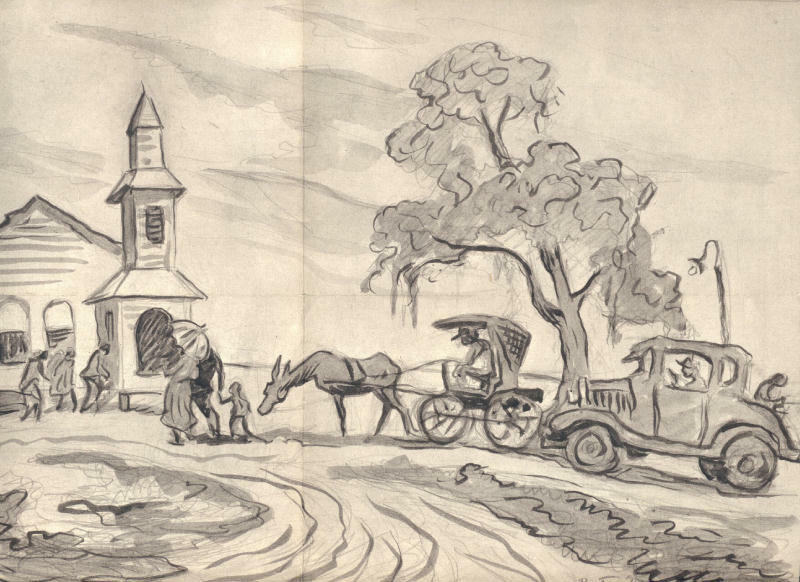 Mom and Dad were personal friends with artist Thomas Hart Benton, and his wife Rita. 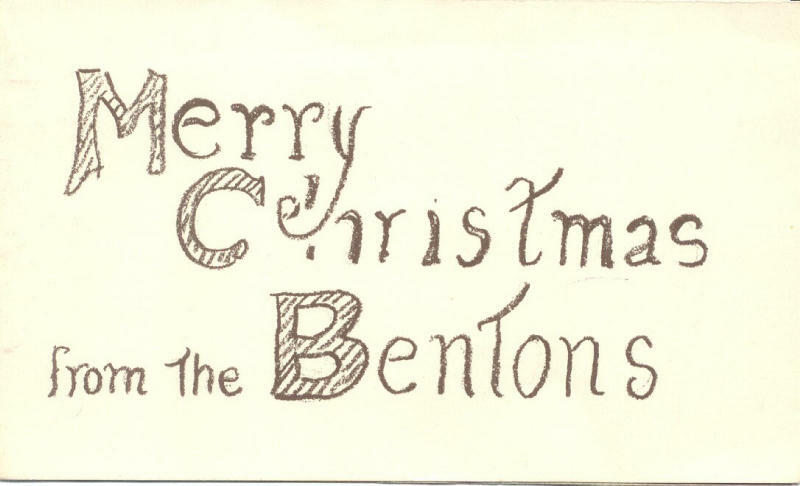 At left you see one of the hand-drawn cards that Tom sent to my folks one Christmas. 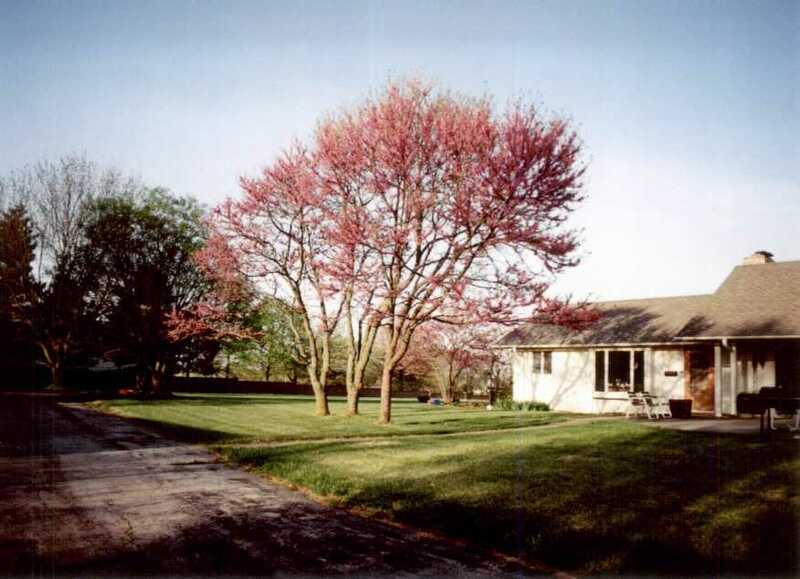 Over the years they bought two of Tom's original oil paintings, pictured here. 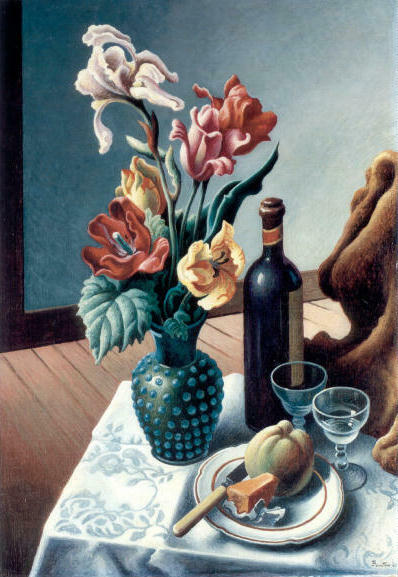 They had the still life (a rare subject for Mr. Benton) until Dad's death, when it was sold at auction at Christy's. The "Water Tank" picture had been sold many years before. You see it here in the background of a picture (at right) that Mom took of my band members in our home in Leawood in the early 1960s. 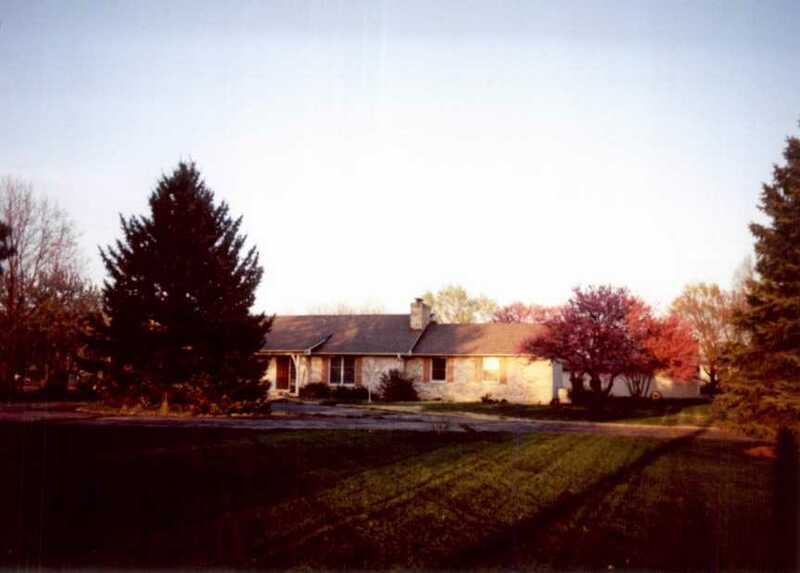 The Olathe home, pictured above, had a rich history of memories for all of us. Below I have depicted a few memories in some surviving photographs. If any of my children or my sister Roberta (or anyone else) have photos that they would like included here, please scan them and attach to an email to me: dan at dansher dot com A description including the approximate date of each image would be helpful, thanks. In the summer of 1969, Yamaha had an overstock of black 80cc cycles. My JoCo Motors Cycle Shop could buy them new in the crate for $180. Dad did not really want it, but I convinced him to buy one. 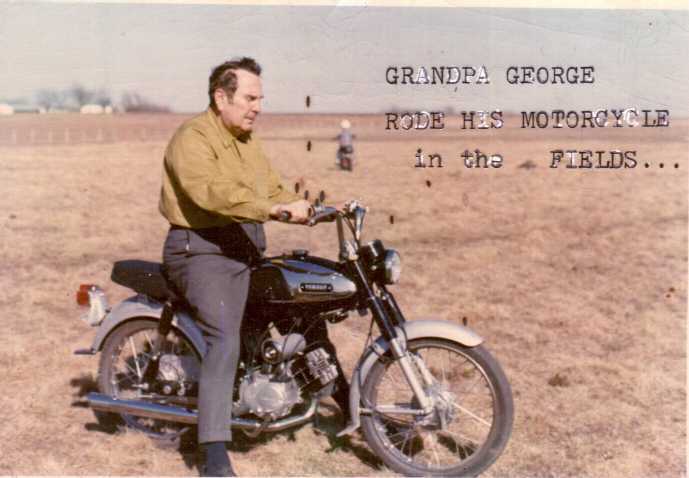 Here he is, hesitantly learning to ride it in one of the fields that surrounded their Olathe home. Several years later he gave it to my sister who moved it and her family to Colorado. After many years of disuse, I believe she traded it for some used horse tack. Dad's 50th birthday was in 1962. 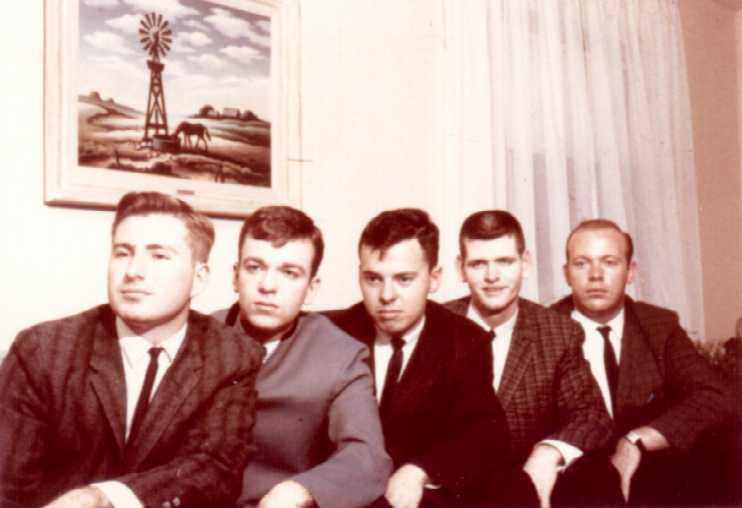 He is pictured third from the left, with his brother Daniel J. Martin standing to his right, and his cousin Bill Vogl to Dad's left. 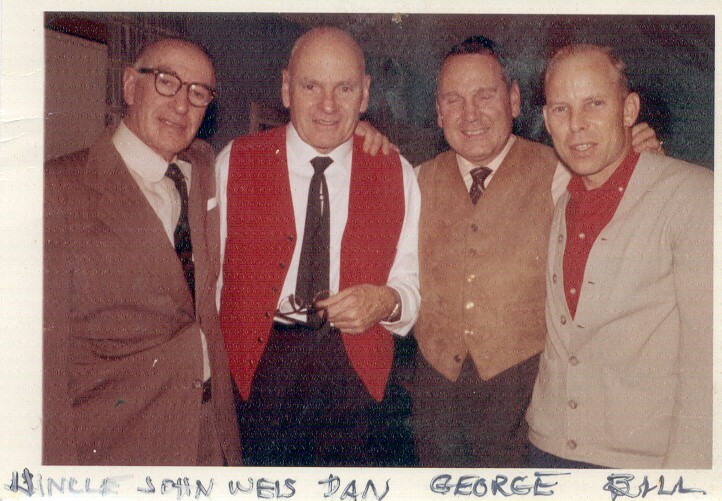 At far left is Dad's uncle John Weis. 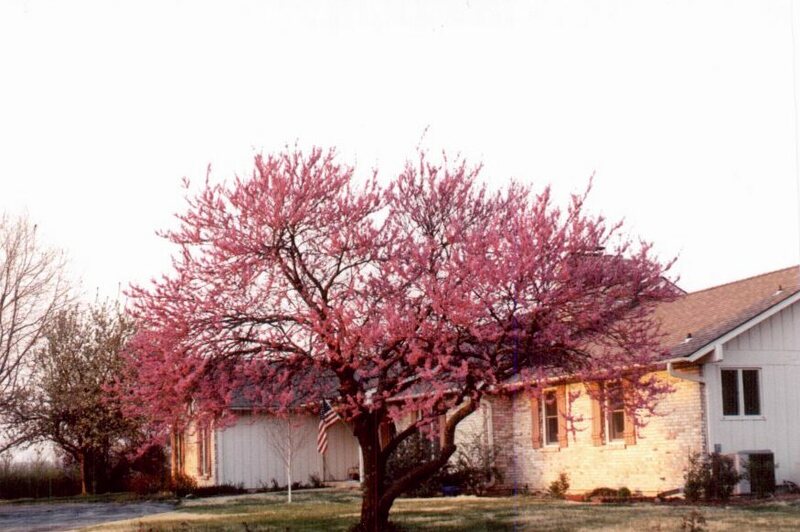 The photo was taken in their Leawood, KS, home (9828 Belinder Road). 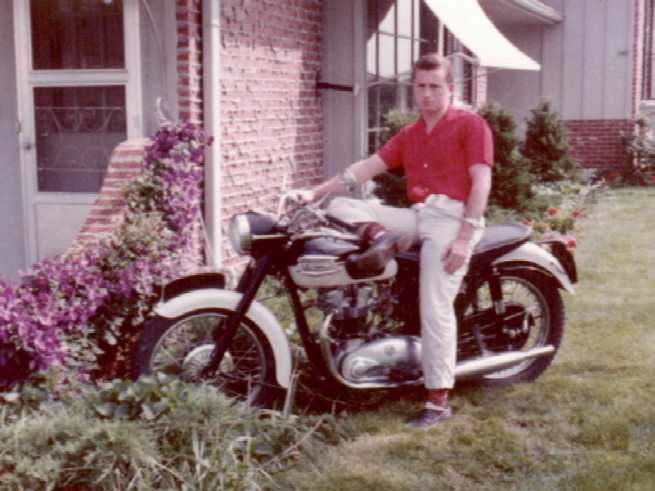 You can see that home in the background of this 1959 photo of me and my then-new Triumph T110 motorcycle. In 1989 Mom arranged to fly my sister and her husband John, and myself, to the Oregon coast to celebrate Mom and Dad's 50th aniversary That was really kind of them as my sister and I were basically broke at the time. On the left all of us are on a balcony overlooking, unseen behind us, the Oregon coastline of the Pacific ocean. 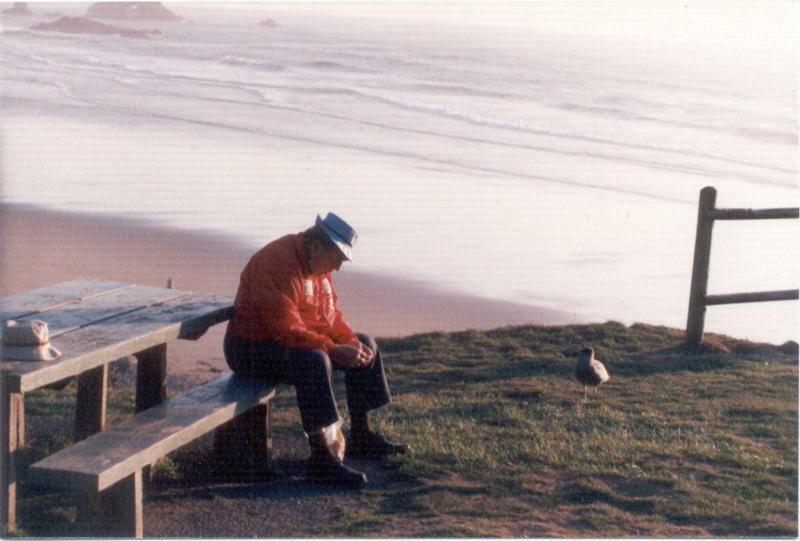 The picture of Dad on the right, overlooking another Oregon beach, evokes a strong sense of sorrow and loneliness in me. It is really hard for me to look at without wondering what he was thinking to have projected such pathos across time to us today. 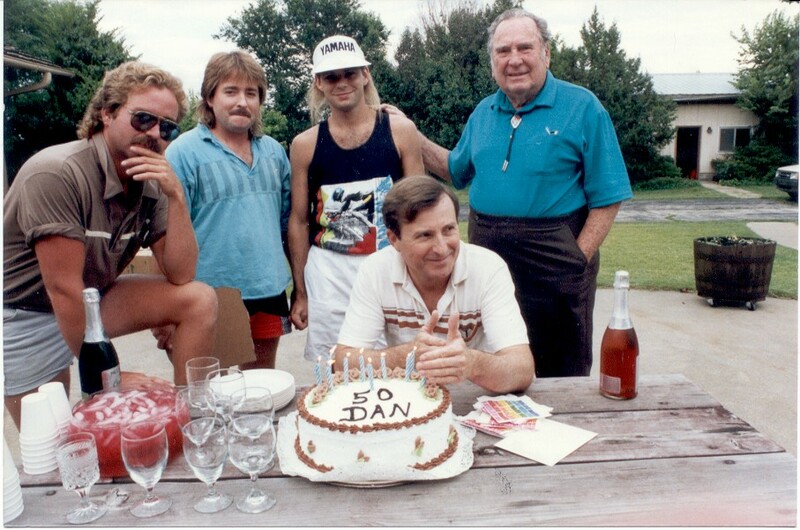 Here we are in 1990 for my own 50th birthday party at my home in Olathe, KS: Dad would have been 78 at that time. My sons Brian, Craig, and Steve (next to Dad) are there to help me celebrate. These are all the surviving "Martin Men" of the day. By then Dad's brother Dan and my son Scott had passed away; Eight glasses on the table indicate three other persons are present but off-camera. 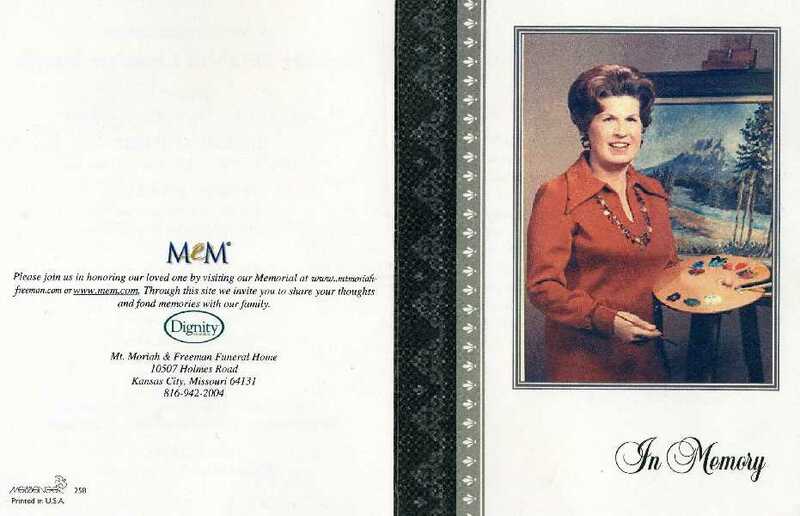 One would have been Mom, and the other my girlfriend du jour (I was between marriages to Sheryl at the time). The third person is a mystery. Most likely a gf of one of the boys (none were married then), or possibly even my daughter Tricia. 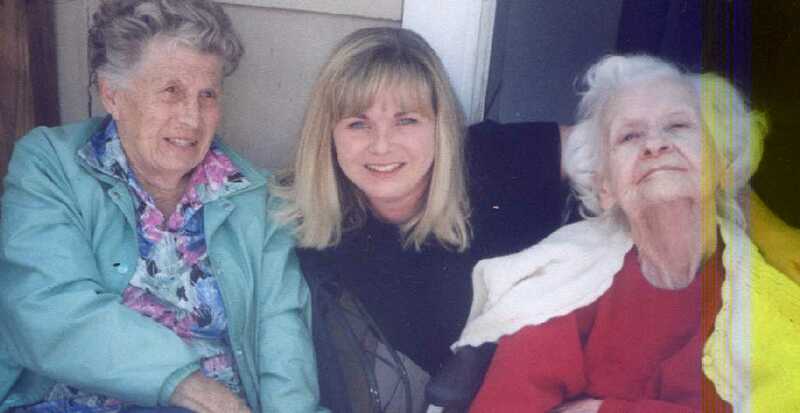 Lest this history seem totally about Martin males, here is a picture of Tricia (center), Grandma Dorothy (left), and her Grandma Francis (right) in the spring of 2003. Probably the first time the three of them had been together in 20 years (it would be the last as well). The occasion was an observance of the 20th year since the death of brother, son, and grandson Scott Martin. Grandma Francis died in January 2004. 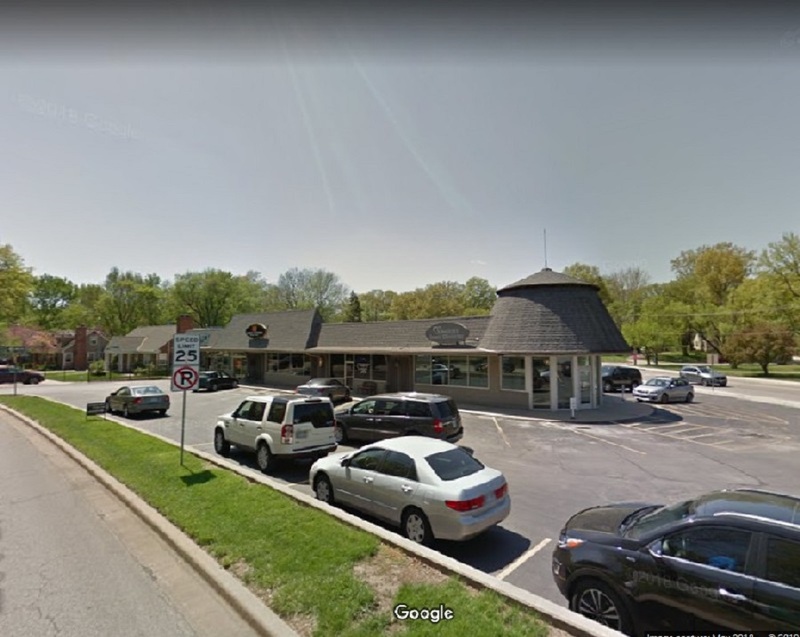 At the end of 2004 Grandma Dorothy moved from her home in Gardner KS into her own apartment in a very nice assisted living facility at 91st & Metcalf in Overland Park, KS. In 2008, Mom had a very nice birthday party, perhaps her last really "good" one. Click here to see pictures of that event. 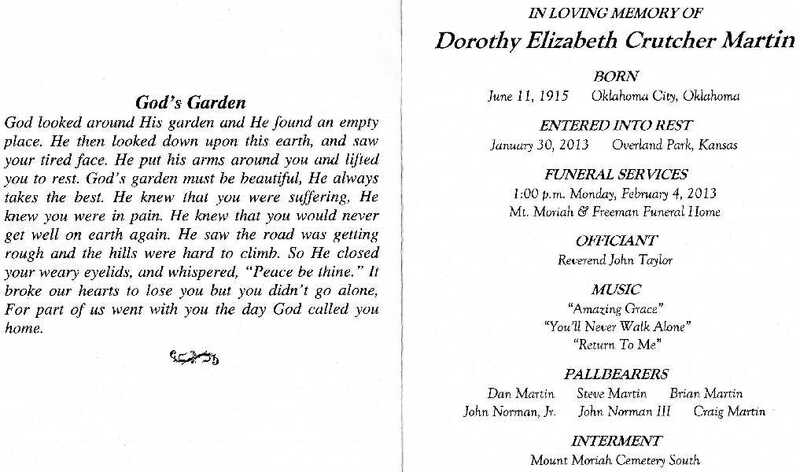 Dorothy Elizabeth [Crutcher] Martin, born Dorothy Elizabeth Crutcher, my Mom, a Grandmother, Great Grandmother, and friend, passed away peacefully at 1 AM CST January 30th 2013. She was 97 years old. 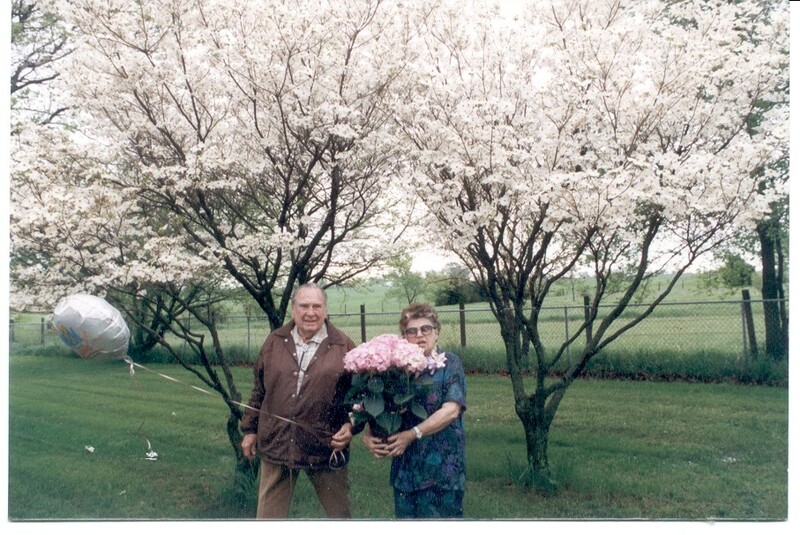 A few of the "paper-things" that Dad left behind when he passed away (age 88) on April 30th 2000 are pictured here. Yet Dad left all of us a lot more than that. There is one thing in particular that none of us sufficiently appreciates. 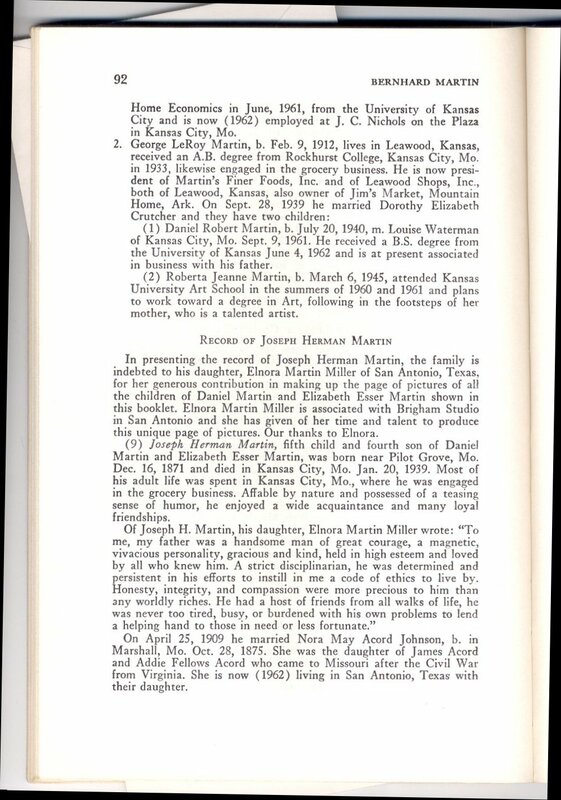 As an example of this special gift, I quote from an obituary (shown further above) of a much older relative, Bernard J. Martin, who had died in 1934: "Mr. Martin measured up to the laws of God and Man... The widow, the sons, and daughter inherit the legacy of a clean name, which is the best of all earthly possessions." My father George L. Martin certainly bore that same standard to the highest degree of diligence and responsibility. In today's Clinton/Enron era of lost honor and loose ethics, we can see just how rare a gift he gave us. 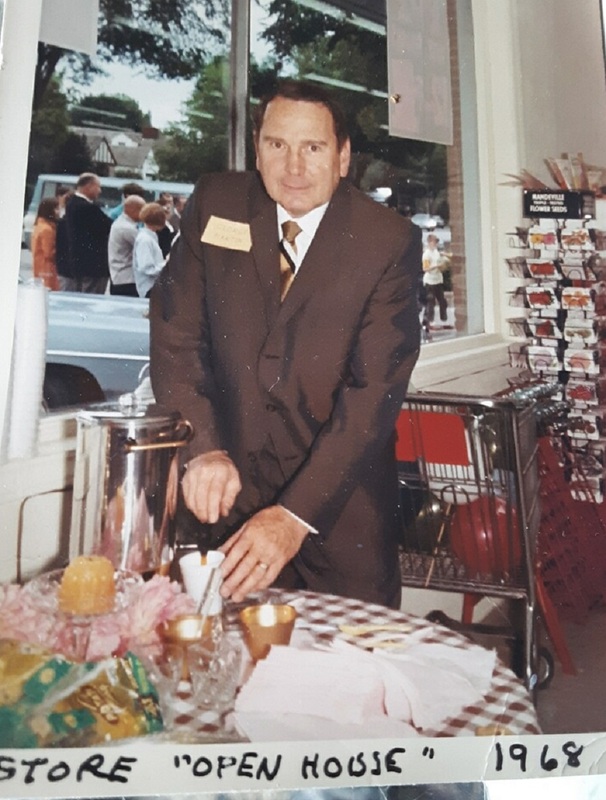 As but one example, when others would have taken an easier way out, my father spent the last seven years of his business life paying off - in full - a $200,000+ debt incurred from a grocery market he opened in Warrensburg MO that went out of business. 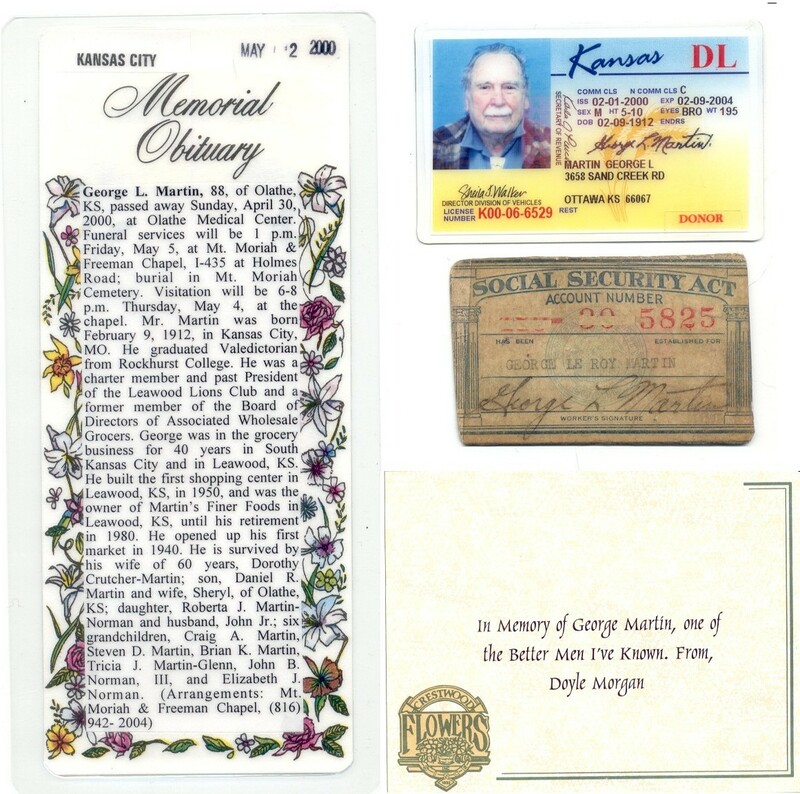 In the end, a card on one of the flower arrangements at his funeral (May, 2000) paid him the highest of honors - one for which I can never qualify myself - It read simply: "In memory of George Martin, one of the better men I've known." 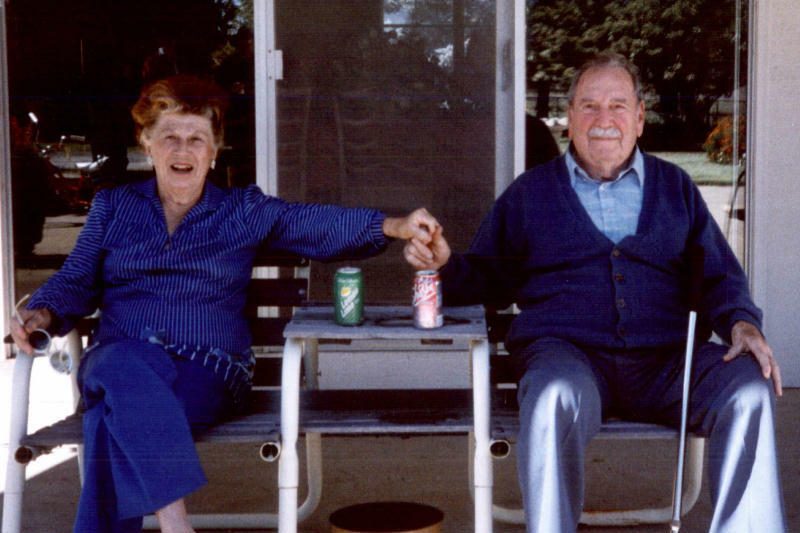 Merry Christmas, Mom and Dad, and thanks for the memories.